In recent years, many of the Gujarati communities in Kenya tend to organize Holi celebration functions, fun and frolic with colours, pichkaris, water filled balloons, delicious food and cool drinks. When I was growing up, I had not even heard of Holi. My first experience was when I went to school in Mt.Abu and got hit by a water filled balloon. It really hurt. Those days the balloons were filled with plain water. Now people fill them with coloured water. I cannot remember anything special being made at home on Holi or any special celebrations. When I got married and came to Mombasa, no special celebrations were organised by most families and communities. The popularization of Indian Television series world over brought all the various festivals celebrated in North, East, South and West right to our doorsteps. With that came more families wanting to celebrate festivals like the way they are televised. Slowly the celebrations became a community event. In our family Janmashtami, Diwali are festivals that are celebrated. For other festivals we go to the temple and nothing much happens at home. These days celebration of Holi has in most places gone out of hand. I remember I’ve had colour thrown at me by strangers walking on the street. For days my skin kept on itching. People develop skin irritation, dry scalp, eye ailments because of the artificial colours. After that experience, whenever I am in India, I just stay indoors till all the dhamal masti is over. I stay away from the party organized by the society too as people get offended when you request them not to put colour on. Just like a lot of other things an individual should have to right to say no to being coloured! Having said all that, it doesn’t mean that I don’t celebrate the festival. I do, in my own way. We put a small kanku (kumkum) tilak on the forehead. I make something sweet to offer to Lord Krishna. Preparing umpteen number of dishes is my style of celebration. This is my second Holi recipe (in advance) for this year. 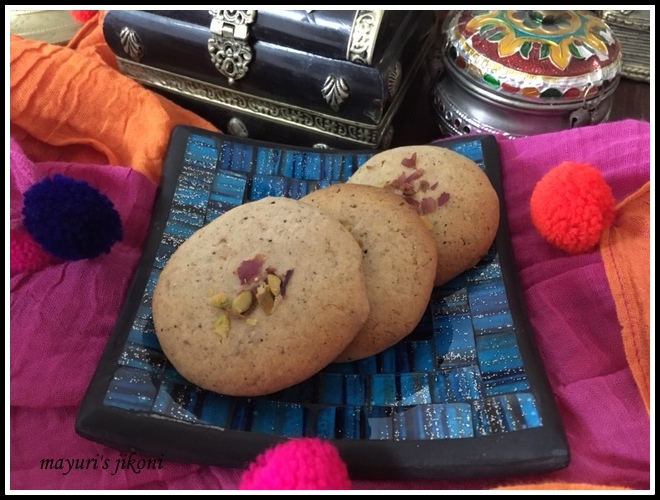 I made the cookies as Jagruti of Jagruti’s Cooking Odyssey invited me to contribute a recipe and my thoughts on the festival of Holi. Check out my other thandai masala recipes. So here’s my second Holi recipe .. thandai cookies. I made a huge batch of thandai masala. I wanted to use white peppercorns but couldn’t find any in the market. Used the normal ones. I don’t add rose petals to the masala as some people don’t like them. I add them separately to whatever I make. Sift flour, cornflour, soda bicarbonate together into a bowl. Add thandai masala and rose petals to the flour and mix well. Cream sugar and butter together till its soft and creamy. Add rose water or milk and whisk together till the liquid is incorporated into the butter sugar mixture. Add the flour mixture and form a dough. Don’t knead it. Just bring it all together. Cover the dough with cling film and leave it the fridge for 30 – 40 minutes. Preheat the oven to 180°C. Grease a baking tray lightly with some butter. Press it lightly between your palms. Top it with a bit of pistachios. Bake for 12-14 minutes or until the edges turn light brown. The cookies will be soft but will harden a bit on cooling. Store in an airtight container if any are left ! If you like you can divide the dough into two. Form a log with each. Wrap it in cling film and leave it in the fridge for an hour or so. Cut slices and bake. Avoid adding rose petals if you don’t like the taste. The dough may appear very soft initially but with become a bit firm after leaving in the fridge to chill. I love the combination of pistachios and rose water. The cookies looks superb, loving all the flavors in it.. Your cookies look divine! I attended Holi in London last year and watched people get covered in coloured chalk. It was fun. Excellent cookies, absolutely gorgeus they are. Mayuri these cookies look so yummy. I like the use of rose petals in the cookies. Never tasted a thandai masala cookie. Must be tasting awesome. Love that you have given tea recipe of thandai masala too. Would be happy to try. Loved the fusion of Thandai flavour in cookies.. the texture of the cookies looks so good, perfect to serve with some adarkwali Chai !! It definitely goes well with ginger tea and they are easy to make. Mina making the thandai powder at home is very easy. However, you may add other flavors too if you wish. I made thandai before and it was so good – I am sure the flavors in these cookies will be so delicious! Mayuri these thandai cookies are so beautifully baked. I need to get back to baking. Seriously this post of yours is taking me back to baking. I do have the thandai powder, so bettter cook some cookies.